Howl was first performed at the Six Gallery in San Francisco on October 7, 1955, by Ginsberg's friends and fellow poets Gary Snyder, Philip Lamantia, Philip Whalen, Michael McClure and Kenneth Rexroth. Soon afterwards, it was published by Lawrence Ferlinghetti, who ran City Lights Bookstore and the City Lights Press. 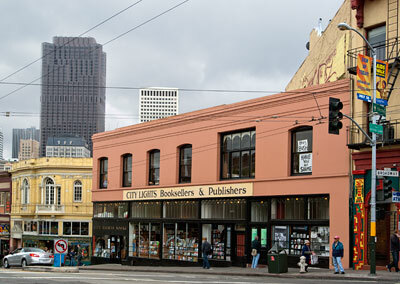 City Lights was founded in 1953 by poet Lawrence Ferlinghetti and Peter D. Martin. Although it has been more than fifty years since tour buses with passengers eager to sight "beatniks" began pulling up in front of City Lights, the Beats' legacy of anti-authoritarian politics and insurgent thinking continues to be a strong influence in the store, most evident in the selection of titles. See City Lights website for the complete Short History of City Lights.